Soft and gentle on all finishes. The Synthetic Sheepskin Wash Pad has all the softness of a traditional sheepskin wash mitt, but without the hefty price tag! Plus, you don’t have to wear the Synthetic Sheepskin Wash Pad – a huge plus for a lot of people. The pad provides the same gentle cleaning for your vehicle in a large wash pad. The Synthetic Sheepskin Wash Pad is made of high quality synthetic sheepskin that pampers paintwork and releases dirt. Natural sheepskin is soft, plush, and nonabrasive – so is the Synthetic Sheepskin Wash Pad! The Synthetic Sheepskin Wash Pad absorbs a large amount of soapy water to provide outstanding lubrication to prevent wash-induced scratches. The plush nature of the synthetic material allows gritty particles to move into the thick fibers and away from the paint. For the best results, rinse out the Synthetic Sheepskin Wash Pad in a bucket of clean water before reloading it with soapy water. This step will release dirt so it is not transferred back to the paint. 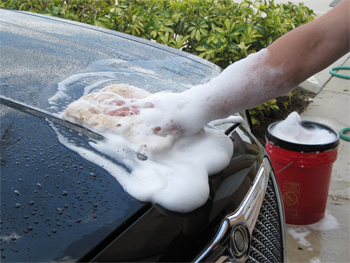 Always use a high quality car wash to protect the paint while you wash. After you wash your vehicle, rinse the Synthetic Sheepskin Wash Pad out well and hang to dry. Trust the Synthetic Sheepskin Wash Pad to pamper your vehicle with every wash.
water to lubricate the the paint while washing. Lifts dirt off gently but can still scrub those tough spots. Pad has been very durable - cleans up nicely. Pad also works well for getting into tight spots (versus a glove-type product. 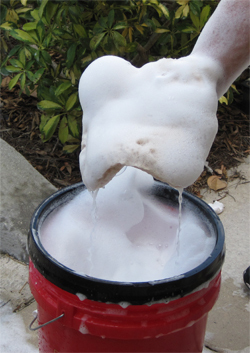 ProsHolds tons of suds, cleans out easy between rinsing. I bought several of these and had a couple of chances to use them already. They hold a ton of suds and glide over the paint very easily, and they're very easy to handle without being a mitt. Very nice, holds a lot of soap, inexpensive. This is a nice pad. I wish I would have read that it doesn't have an opening for your hand. Only used it once so far, but does the job.